Situated within the lower component of the Albayzin, El Clandestino is the option for those seeking intimacy, in private rooms, while enjoying all of the common areas and services that this guesthouse offers you (cooking area, Internet, Television room, laundry service). Location is silent and we were pleased to relax out away from the city centre, but at the same time, walking there was not too far. in case you hate walking you would need to catch some busses though (1. 20 each journey). Employees were really helpful. Beds really comfortable. Great shared areas and kitchen. The woman who worked, Carolina, was absolutely phenomenal. She gave us a map, showed us all the places that we should visit, answered all of our questions, etc. The environment of the hostel is extremely laid back. 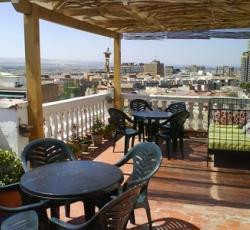 There is certainly a great patio with an amazing view of Granada. Plus, toast and coffee ahead of leaving the hostel was a plus! The staff were amazing along with the scenery from the patio were stunning! It was a decent location; walkable distance from most touristy stuff but as mentioned, a little hard to find. Felt really at home on the terrace, cooking area and living areas. The receptionist was really friendly and attentive and made us really feel calm and at home. The room was clean and spacious and so was the bathroom. The street is hidden but a gorgeous region to walk around with lots of cute cats! There was a nice rooftop with tables and a couch for sitting outside. The rooms were reasonably clean for the price. The location is totally brilliant - about a 10 minute walk into the principal portion of town but this means its really quiet during the night and there are plenty of small bars and cafes inside a couple of mins walk. The employees are excellent, warm and friendly and were more than pleased to help with anything we needed. The roof rooftop is remarkable and provides views over the whole city as nicely as the cost is most likely the cheapest anywhere in Granada. STAY HERE! Its like living in a shared flat and no in a common hostel! The reseption was very-very helpfull. I felt like home for one week that i stayed there! Along with the rooftop is great for relaxing! Very nice terrace and neighbourhood, with white covered houses of Albayzin. * El Clandestino Hotel rated 4.33 out of 5 based on 9 customer reviews. Hostel reviews with a star rating are sourced from HostelBookers. If you find El Clandestino Hotel with the same booking conditions at a lower rate somewhere else on the internet after you have booked, we will refund you the total difference.